Need a little something to liven up your seating area? These sweet fabric flowers will tie your table together nicely. They would be a sweet addition for a bridal shower or garden party as well! Cut 7 petals out of your main fabric. Freehand them for an imperfect natural look, if you’d prefer uniformity find a petal from a flower you like in nature and trace it for a template! Cut one small circle in a coordinating fabric to be the center of your flower. Fold each petal about a quarter inch up, in the center of your fold make a small cut. Cut a small hole in the circle as well. Cut your twine to size and using both ends thread through the cut in the petals one by one. Thread through the center circle lastly. 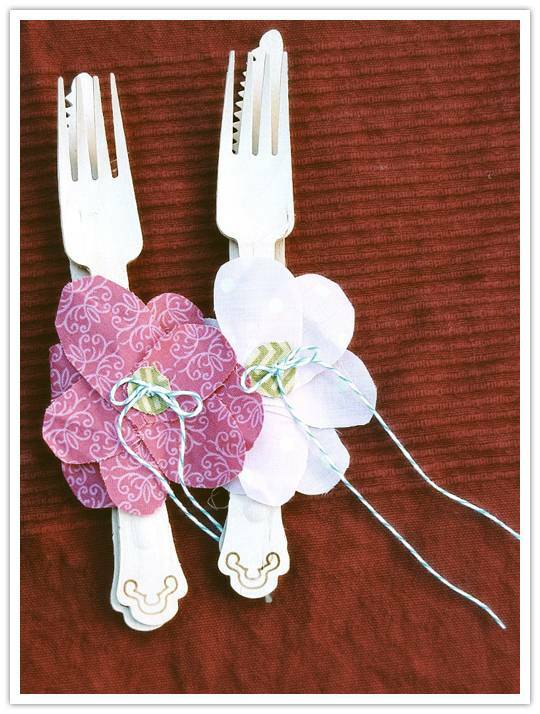 Fan out your petals and slide your silverware into the back loop of the twine. Tighten with a knot and bow to complete the twine stem. Victoria Hudgins is author of The City Cradle where she shares her handcrafted celebration designs and do it yourself projects. She is an event stylist living in San Diego, mom to twin toddlers and a passionate lover of beautiful artisan design. GREAT diy! Love the fabrics and everything! WHERE! did you get that wood “silverware”? I am in Love!